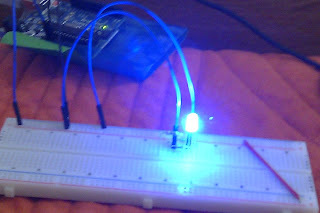 This weekend I started playing with a RGB LED. This LEDs have 3 separate light emitting materials. One for red (R), other for green(G) e the last for blue(B). As you can see in the image below, there are 4 leads. This LED has a common cathode, which means that all 3 parts share the connection to GND. From up to down, we have Blue, Green, Ground and Red. To start experimenting, I searched for a generic datasheet, as I don't know any reference for this LED. It recommended a 20mA current and stated that the typical voltages are 2.0V (Red) and 3.2V (Green and Blue). As I was drawing power to the breadboard from the Arduino (only for power), I did the math for the resistors. There where 3 150 Ohm resistors in the anti-static bag the LED came in, but I decided to use 100 Ohm resistors for green and blue. Next step, how about lighting all at once? It would be nice, but there was a problem. 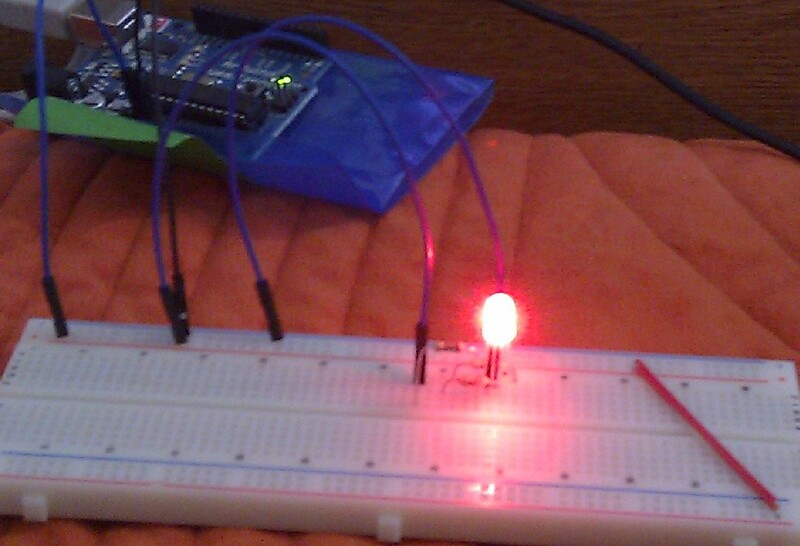 When I disconnected the GND from the breadboard, I accidentally let it touch the lead for the red color. 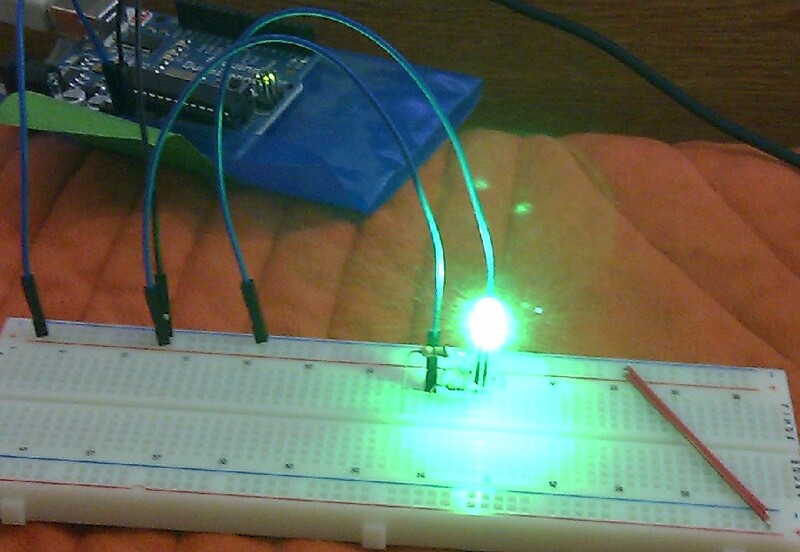 Without a resistor to limit the current passing at the moment, it burned out in a second. So what could I do with a 'limp led'? I tried to combine the green and the blue colors to see the effect, but I ended up getting a slightly lighter blue. When I read the datasheet I noticed that the brightness (measured in candela) of the 3 colors isn't the same. It also looks like the blue color is more diffuse (spreads all around) as the green light appears more directional. I filmed it try to show what I mean, but the colors aren't very noticeable. The good news is that I ordered a 100 RGB led pack on eBay, so if all goes well, I will try again soon. P.S. The LEDs have arrived, all working and with some free resistors. Thank you giorgio11185!